Ceres is a Roman goddess of agriculture, grain crops, fertility and motherly relationships. Her name means "bread" or "grain". The Romans melted most of the Greek Demeter (Earth Mother) cults and traditions with their Ceres. 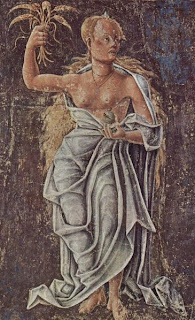 As Ceres' daughter, Libera was also called Proserpina. Not "first snake" but from "proserpere - to emerge". This triad of deities is essential for agriculture and also bound to other cycles of life and death. Libera is not considered to be the same Goddess as Libertas, though I can easily think they are the same. Libera Proserpina was celebrated in the middle of March... The jump to Lady's Day; Spring Equinox; Easter/Ostara; Pesach, isn't long, and what is Easter anything but the festival of freedom and liberty? The Pagans welcome Libera Proserpina back from her "incarceration" with Pluto, underground, and bring offerings of grain and spring flowers to Her and Her Mother. The seed has been sleeping in Her grave and now bursts out from Her dark jail, to grow and bring life to Her subjects. One could also get "all metaphysical" here and think about our life, our incarnation, as a period of freedom in our spiritual life. When we are dead, we are like angels, without free will. Depending on the culture, we might just sleep, or be tortured, or just wander around as willess spirits, shadows, ghosts, or perhaps we are in heaven praising God in eternal glory or merge into the Great Spirit and become one with it. I cannot remember any spiritual belief system where "life after death" means you continue "living" as you did in life, making your own choices, having goals, experiencing things, participating in life just as you did before. I suppose zombies get close, but zombies are considered being dead and not doing this "life-thing" of their own free will and choice. Also, in some reincarnational beliefs "life after death" is seen as some sort of preparing period, where you can "catch up" with what you didn't do in you "real life". I was checking out my "commitment" - I haven't been baking much anything the whole year, except some Danish Rye. The "Bread Baking Babes" have been baking things. Among others Austrian Strietzel. That is not the same thing as Streusel, even though they sound very similar. Streusel is one of my favorites, how ever you make it :-D It means basically "baked goods with crumble topping". These are absolutely perfect recipes for Lammas, that's in only two weeks from now, and suit well to be frozen, if you make a lot. It's not the best season to bake, though, as it's so darn HOT! But, dog days. Summer King has lost and is angry, so he makes everyone suffer. As food, I suggest grits, polenta, farina - corn porridge in different shapes :-) It is really nice during the hot days, and eaten a lot in Southern Europe and Southern USA and Mexico. You can use grits - or corn custard - for any meat.